JoCo Cruise Crazy 3 Guest Fortnight is over! We are safely docked somewhere in Alabama or Mississippi or one of the other states you are supposed to completely avoid. The passenger unload is going much faster than anticipated since we don’t have any luggage. I mean we HAVE luggage, but after 4 days without power or running water pretty much everything became a de facto toilet. We’ve drunk all the fresh water from our souvenir snow globes and boiled the shells from our souvenir necklaces to make a sort of broth we called Sea Juice. All in all this trip was 100 times better than the time I went to Branson. If I may be ever so slightly serious for a moment, JoCo Cruise Crazy 3 was once again a transformative experience. I made new friends, strengthened old friendships, frolicked on tropical beaches with some of my favorite people and received world class entertainment every single day and night provided by some of the most wonderful funny people, musicians, and purveyors of talent that I have ever shared a floating mall-hotel with. If you are on the fence about going next year, GET OFF THAT DAMN FENCE! It’s a week of fun that you will never forget or regret. It’s crazy expensive, but what are you going to take with you when you die? Money or memories? (If they find a way to let you take money with you when you die, I will go back and amend this post, because… I mean, c’mon. That would be AWESOME.) I haven’t even gone through my photos yet, but if I do make Fancy Photo Comics of this trip I will post them somewhere besides the front page of the website so that those of you (heartless, joyless wretches) who do not enjoy them will not have to be unnecessarily burdened. This final Guest Fortnight offering (on the theme of me accidentally getting on the wrong boat) comes from my friend Chris Hallbeck of Maximumble, Minimumble and his flagship comic The Book Of Biff. Chris and I are both parents of young children and seem to share many of the same ideas about raising a functional, exceptional human in a weird internet world and blah blah blah mushy frienship whatever HE MADE THIS SHIRT WHICH I THINK IS VERY FUNNY. Also this mug. Funny. Go buy those things. JoCo Cruise Crazy 3 Guest Fortnight is nearly back to the mainland! The pod of friendly humpback whales there were towing our powerless and increasingly Thunderdome-esque vessel back to Florida ended up being chunks of that possibly mythical, Texas-sized trash island that broke off and developed sentience. Monstrous trash whales are truly the gentle giants of the sea. 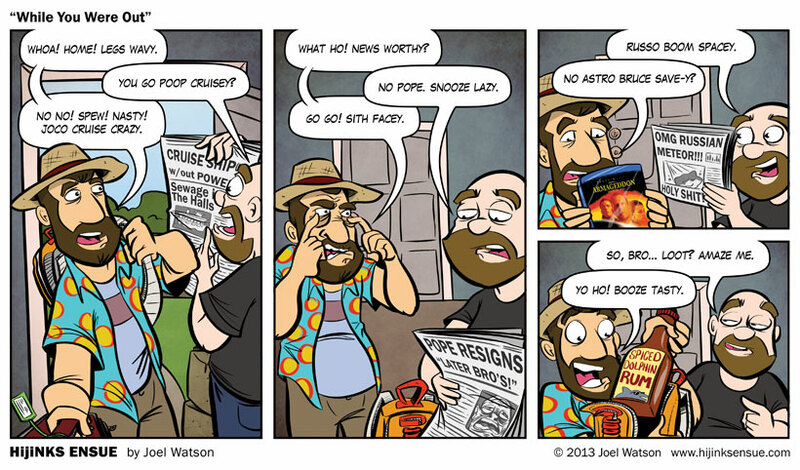 As I mentioned yesterday, the final 3 Guest Fortnight comics feature three different artists taking on the same idea. What if I got on the wrong boat? I mean, I like big boats and I cannot lie. Who’s to say I’m going to be super picky about WHICH big boat I stumble onto? They all look pretty much the same. Round, juicy… bubble…y? You know? Boats. Fellas? Fellas? Does your girlfriend got the boat? 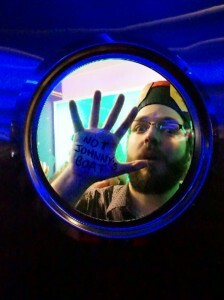 JoCo Cruise Crazy 3 Guest Fortnight is dead in the water! No power, no food and plenty of sea-wage backed up into the staterooms, we’re now being towed back to port by a pod of friendly humpback whales. 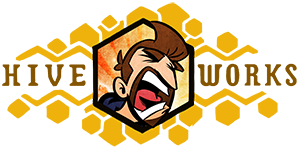 I’ve decided to cut the Guest Fortnight a bit short (you will still see the 2 additional guest comics when I head out to Seattle for Emerald City Comicon in a couple of weeks), since coming home from the JoCo Cruise has left me creatively charged and I am anxious to get back to work. 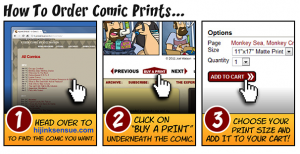 A weird thing happened when I put out the call for guest comics a few weeks back. Actually two weird things. First, nearly everyone I asked said yes. I usually ask for at least twice as many guest artists as I need expecting plenty of no’s. This time around the no’s were not to be found and the fantastic comics just kept hitting my inbox. The second weird thing is that three of the artists had THE EXACT SAME IDEA and turned in their comics at roughly the EXACT SAME TIME. It was obvious that a certain topic (one regarding folk covers of songs about butts and television networks drunk with power and copious legal council) was on a lot of peoples’ minds and ready to be made fun of in comic’d form. I’m going to post all three of these comics in a row so you can see how three fantastic comic artists interpret the same idea. They’re all great and come at the subject from a different angle. 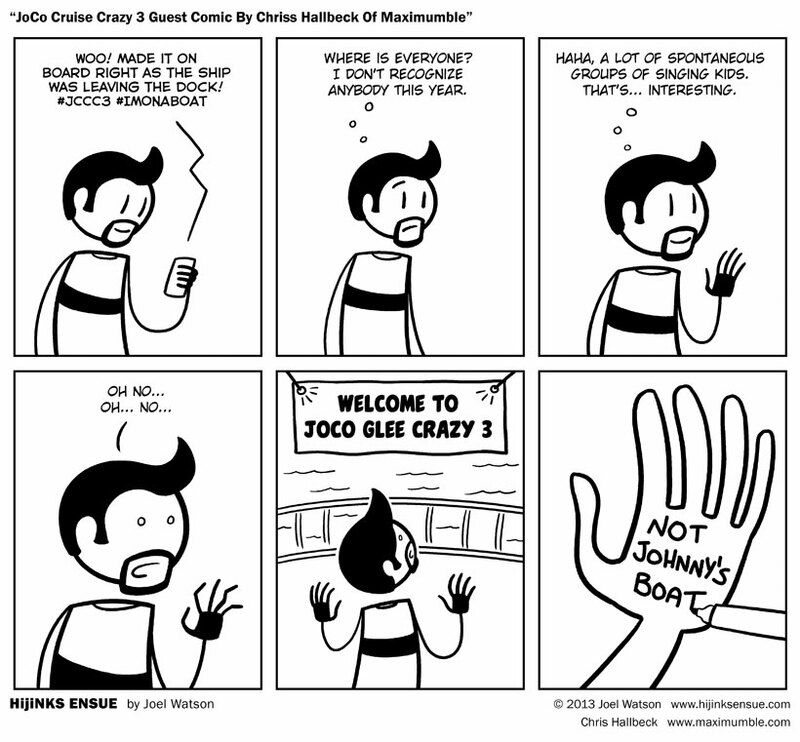 The first offering this week is from John Kovalic of Dork Tower, Munchkin, Apples To Apples and SO MUCH MORE quality geekery. John and I spent most of the last couple of years just barely missing each other at cons and other geek gatherings. Finally, at last year’s SDCC and the ensuing W00tstock, we had a chance to sit down and talk (for maybe 5 minutes). Needless to say, we need to have more adventures in the very near future because he’s a hell of a nice guy and a fine cartoonist with a geek-cred-resume a hundred miles long. COMMENTERS: Have you ever gone on a “bait and switch” trip, vacation, conference, convention, etc? My wife and I took an all inclusive resort trip to Puerta Vallarta back in 2006. This was before we drank and it turned out that drinking was essentially the only this this particular resort offered. I guess the idea was to keep everyone so drunk that they didn’t care that the food, amenities, entertainment, excursions and ALL OF THE REST OF PUERTA VALLARTA were terrible. 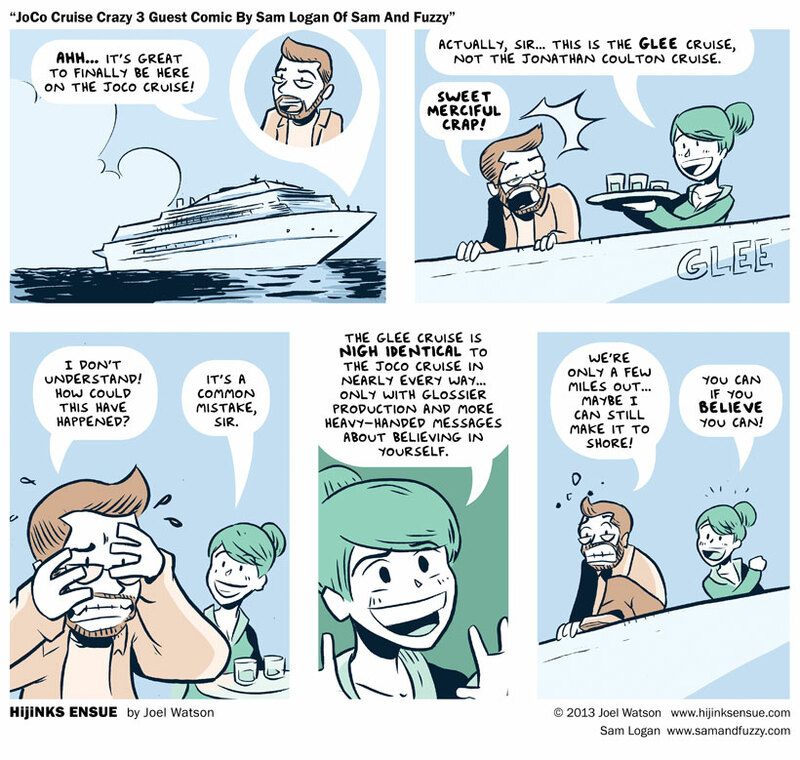 JoCo Cruise Crazy 3 Guest Comic Fortnight wraps up week one with this stunning depiction of, what I can only assume, are completely factual events by E.K. 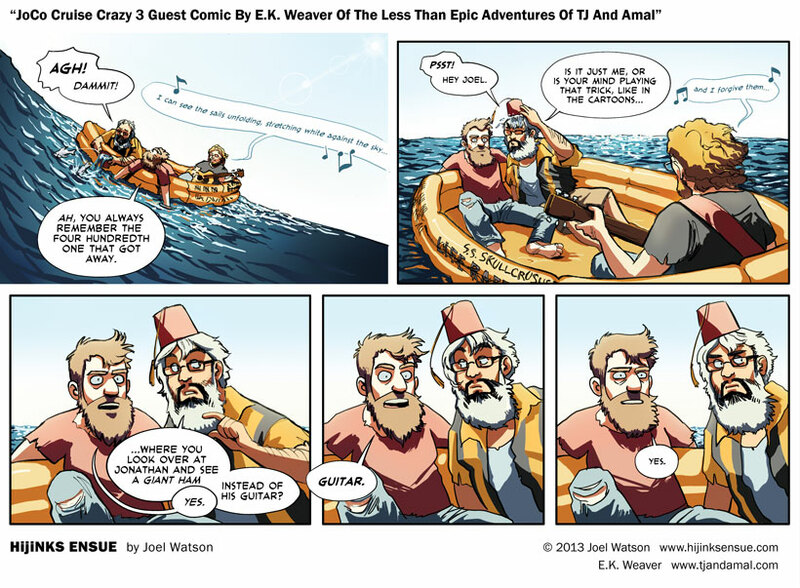 Weaver of The Less Than Epic Adventures Of TJ And Amal. The only part I find highly suspect is that Lar and I would be in the same life raft with Jonathan Coulton. When you’re headlining your own cruise, I’m pretty sure they reserve space for you on some sort of emergency evacuation mini-sub with the captain, first mate and probably a sentient, talking dolphin. Or at least a narwhale that knows sign language. I meat E.K. when we were on a panel together last december at Dragon’s Lair Webcomics Rampage. We didn’t get much of a chance to talk or hang out that weekend, but I was really floored by the quality of her work. Her comic is a stunningly drawn, gay positive long format story and I recommend it to those of you who are fans of quality. Thursday, eh? So is this day five of the cruise? Is this even a day? Is there still a world on the other side of this vast expanse of ocean and boat-smashed whale carcasses? My brains are no doubt sunbaked and rum-basted beyond cognition by now. The inhabitants of our city-ship have abandoned human language in favor of communicating only in sea shanties. We barter for leftover buffet hard rolls and pancake batter with jewelry made from the bones of our dead. There are two factions on board. Those that wait for people to die before making their ankles into anklets, and my team. The winning team. Oddly enough, all of this was outlined in the brochure. COMMENTERS: Have you ever been in an emergency evacuation situation? When I was a kid we were eating at a Red Lobster when flames started shooting out of the kitchen. We ran outside as the building burned. This dude next to us had taken the time to rescue his plate of crab fettuccine. I assume his priorities regarding survival began to shift as soon as he realized his meal was going to be free. I would not be surprised if he tried to order some Cheddar Bay Biscuits[TM] to go on his way out of the collapsing structure.